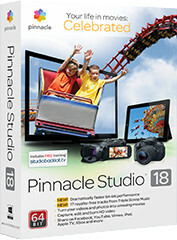 Get ready for a faster, more responsive movie-making experience with Pinnacle Studio 18. Now with a native 64-bit architecture, Pinnacle Studio lets you make the most of your computer’s processing power and memory for faster multi-track rendering, better file handling and more. Easily import and edit your clips right inside the built-in media organizer. Try SmartMovie to make a movie in minutes or dive into editing on the 6-track timeline. Add excitement with over 1,500 2D/3D effects and royalty-free music. Love your movie? Easily share it on Facebook, YouTube and Vimeo. Easily import your videos and photos from any device, and then organize them in the built-in media library. Crop, pan and zoom, and clean up your clips before you make your movie. Then use them again in any movie project. New to video editing? Just drag and drop elements to make a movie automatically or use the Storyboard mode to plan. More experienced editors can use the timeline for precision editing. Choose from over 1,500 2D and 3D effects to surprise and delight your audience. Multi-layer editing allows you to combine up to 6 video and audio tracks. Also create custom-fit soundtracks with Scorefitter. Easily post your HD and 3D videos on Facebook, YouTube and Vimeo. Create DVDs to share with family and friends. And export your movies to popular devices. Video Editing, Live Screen Capture and more! 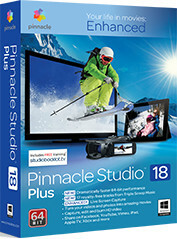 If you’re ready for a more robust video-editing experience, Pinnacle Studio 18 Plus combines the powerful new 64-bit architecture of the standard version with the tools you need for more advanced projects. Record directly from your screen to add dynamic content to movies and demo videos with enhanced Live Screen Capture. 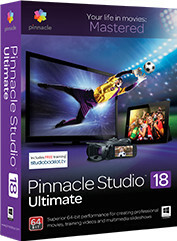 Create sophisticated movies with 24-track frame-accurate editing in HD and stereoscopic 3D. Choose from over 1,800 effects, titles and templates, and add a custom soundtrack for pro-quality results. Easily share your HD or 3D movies on Facebook, Youtube and Vimeo, or export to share on popular devices. Choose from over 1,800 2D and 3D effects to surprise and delight your audience. Multi-layer editing allows you to combine up to 24 video and audio tracks. Also create custom-fit soundtracks with Scorefitter. Post your movies online with one-click sharing to Facebook, YouTube and Vimeo. Create DVDs, and export your movies to popular formats to play them on game consoles and mobile devices. Motion Blends - Video transitions that twist, turn, zoom, smear and spin. Light Blends - Light-inspired scene transitions with light flairs, orbs, rays, strobes and more. Film Effects - Create an authentic, old school film look with blemishes, jitters, spots, scratches and graininess. Stabilizer - Stabilize shakey video to easily create steady footage. Video Essentials 2 - Create a vignette, swap specific colors in a scene, add picture-in-picture, and correct lens distortion. Video Essentials 6 - Remove subtle imperfections, replicate footage into a video wall, magnify a video segment for emphasis. Video Essentials 7 - Avoid tedious keyframing when applying pixelation, easily pan and zoom on still or video, and more.